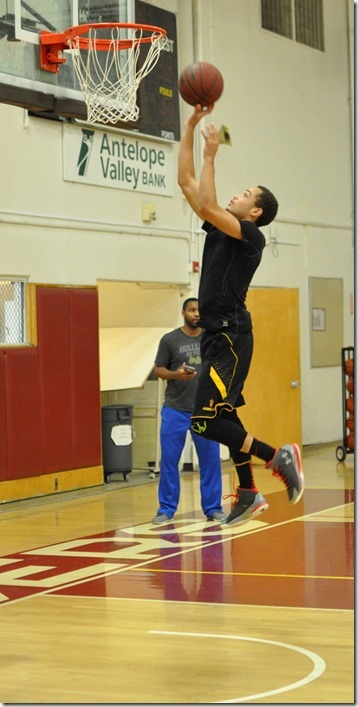 Cory came to AVC very late in the summer of the 2014-15 from Inglewood HS and was behind the sophomore dominated team at AVC in system knowledge and physicality but was full of potential. Cory and the AVC coaching staff decided to have him red-shirt. Although Cory had the grades to move directly to the University level, he missed on his SAT score. His goal to play D-1 ball and get a scholarship an ultimately play at highest level possible. Corry wants to improve his ball handling and get stronger. It turned out to be a great red-shirt year for Cory Dollarhide. He took his academics seriously. Cory never missed a practice. He gained 15 pounds of muscle in the weight room. Very bright young man who has learned the AVC system. Finally, a deadly long range shooter, a much improved defender and ball-handler, an “Inglewood” tough guy and a quiet leader. Expect great things from Cory this year. Improved every game in the Summer Shootout. Knocked down three straight three balls to help AVC pull away from Saddleback for win. Sstanding out in workouts is freshman guard Cory Dollarhide, 5’10”, 175. Cory, from Inglewood High School, who red-shirted last year at AVC, is one of those players who is a high character individual. Finishes first in all conditioning workouts. Dead eye shooter and shut down defender. Add to that he is a tough guy who is smart and never gives up on a play.